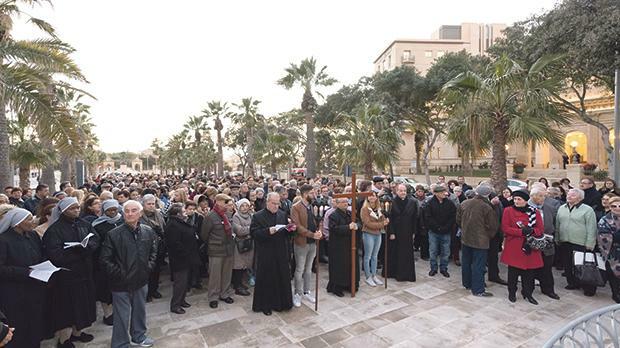 The Diocesan Way of the Cross, led by Archbishop Charles Scicluna, will be held today at 7pm, leaving from near the statue of Christ the King (opposite the Phoenicia Hotel) and ending near St John’s Co-Cathedral in Valletta. This year’s liturgy is an adaptation of the one Pope Francis read last year during the Way of the Cross at the Coliseum in Rome on Good Friday. At the end of the event, Mgr Scicluna will bless the congregation with the reliquary of the Holy Cross – one of the most important reliquaries of the Order of the Knights of St John, brought to Malta by the Knights of Rhodes and treasured at St John’s Co-Cathedral. The Way of the Cross has its origins in the 12th and 13th centuries and is a reflection of what Jesus passed through until he was crucified. Although most of the stations are based on what the four Evangelists revealed in their scriptures, others are the fruit of traditional devotion. However, the Way of the Cross remains the most beautiful prayer during Passiontide. Everyone is encouraged to take part.